This book doesn't come out until April, but it is oh so fabulous, and you should definitely have it on your radar! Thanks a billion to Kay Cassidy who included me in her tour! Kay Cassidy's The Cinderella Society is a divine, delightful read that's just as much about empowering yourself and sticking up for what's right as it is about the romance and fun stuff. What makes this book so fun is the Cinderella Society, a secret group that is surprisingly extensive and super secretive, which is an element that will certainly attract readers who are also fans of Ally Carter's Gallagher Girl's series. Cassidy also populates her book with realistic, down to earth characters, many who are popular and nice, and genuinely care about doing the right thing, not the latest designer item or the juiciest bit of gossip. These positive role models are a breath of fresh air, a relief from the numerous catty and snarky popular girls that tend to be popular in YA. 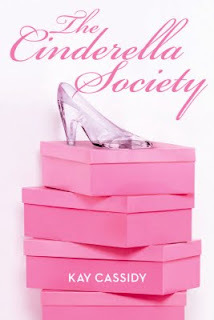 The Cinderella Society is hitting bookstores on April 13th, 2010, coming from Egmont USA! This looks amazing(: I really want to read this, nice review! I want to read this book so, so, SO badly, it looks so fun and unique and cute! Great review. Great review, I also enjoyed this book! I got an ARC of this book last week and am looking forward to reading it!